Every move seems to come with an overwhelming number of options, so with our Free Truck Rental program we can ease some of the uncertainty. Instead of researching and pricing out moving companies and truck rental options, you can just let us take care of your transportation. 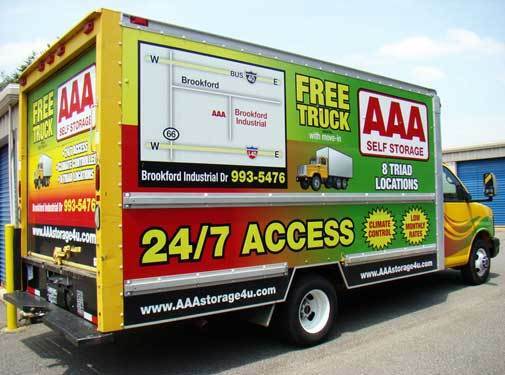 Each AAA Self Storage facility offers the free use of a moving truck when you rent one of our storage units for the first time. Contact your local office and one of our staff members will walk you through the process, working with you to find a perfectly sized truck for your items, and a convenient time to schedule your move. The Truck is Free. Really. Although our staff is knowledgeable in every aspect of moving and storage, we are not a moving company, so you will need to either hire movers or do the heavy lifting yourself; we’ll supply the wheels. It’s a one-time move-in offer so everything should be packed up and ready to go when your rental truck arrives. (See our Storage Tips section if you need a little packing encouragement.) Our Free Truck Rental program is a popular one so we do need to adhere to time commitments. Whether you live in Browns Summit, Greensboro, High Point, Jamestown, Kernersville or Winston-Salem, our fleet of trucks is never far away. Just contact your local store to speak directly with a AAA Self Storage representative for complete details. Certain restrictions apply.